Do what you love, every day! Join the Bachelor of Science (Marine Ecology) and help us make new discoveries about the sea and the life within it every day. You could even help preserve that life for the future. More than 70% of the Earth’s surface is covered by seawater - this marine environment plays a crucial role in supporting life on our planet. It is diverse, complex and a valued natural resource. The Bachelor of Science (Marine Ecology) will teach you about the principles and processes underpinning marine ecology, the vastness of life in the seas and coasts. You’ll learn that much of the marine environment remains undiscovered. Imagine monitoring whale movements and their impact on fish species or providing consultancy on sustainable practices for construction near waterways. As a marine ecologist your unique skills and knowledge, will be in huge demand and lead to a range of jobs working independently or for agencies like DOC, NIWA and the Ministry for Primary Industries. Learn about majestic creatures of the underwater world, gain skills for estimating dolphin populations or investigate an area of marine ecology that interests you through our courses: Quantitative Statistics, Marine Mammalogy and Topics in Marine Ecology. You can apply for scholarships from NIWA and the Ministry of Primary Industries. Our connections and innovation in marine studies mean our students are highly regarded among these agencies and are very successful in gaining these scholarships. Massey’s marine ecology programme will introduce you to the biological principles and processes that are basic to all forms of life in the sea. You will learn about the ecology of marine organisms; how they interact with one another; and with their environment and the land. You will gain a solid grounding in marine ecology history and theory. Studying at Massey will also give you practical skills in field biology and data analysis and support you in formulating and answering complex questions about the marine environment. Understanding the sea is a multidisciplinary endeavour encompassing biology, ecology, statistics, physical and the social sciences. At Massey we have expertise in all these areas - you’ll get access to our experts across all the sciences. We also have world-renowned experts in quantitative marine statistics and marine mammalogy. If you wish, the opportunity exists to further specialise in these fields of research at a postgraduate level. A Ministry of Education report, undertaken over nine years, showed that those who complete a qualification in a science, technology, engineering or mathematics field of study have high relative earnings after they complete their study. Earnings can be substantially more than other graduates. The Bachelor of Science aims to give a broad scientific education. You’ll get a strong foundation in the key science subjects, as well as the indepth knowledge of biological sciences directly relevant to a career in this field. 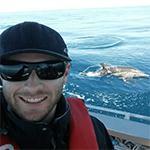 Returning from fishing near Whangarei one day, I spotted a large pod of dolphins and a mother-calf pair of whales. It was then I knew I wanted to dedicate my life to working with whales and dolphins. Massey appeared to have a good ecological department and the courses looked hands-on. As I did not graduate from high school and was enrolling as an adult student, I felt Massey provided me with the best opportunity and support for my situation. I was given a solid foundation that allowed me to get to the next level of study. For almost two years during my undergraduate study I volunteered for a PhD student who was researching the common dolphins in the Hauraki Gulf. This gave me skills I could apply in the field and in the lab and eventually led to my postgraduate opportunity at Massey. For my master’s, I am researching why Great Barrier Island waters are important for bottlenose dolphins and to identify differences in behaviour between areas of high and low levels of tourism using behavioural and acoustic recordings. I am also assessing the usefulness of citizen science in cetacean research and identifying the occurrence of bottlenose dolphins around the North Shore and Whangaparaoa coast. I will describe the acoustic repertoire of bottlenose dolphins at Great Barrier Island and maintain a photo-ID catalogue for the Hauraki Gulf. Marine ecology opens the door to an exciting and dynamic career.